If you use “Ultra-microtome” on your lab or factory for slicing very thin materials, our diamond knives are probably suitable for you. Yes! If you have been looking for other knife provider, we will be the one. Our knives are called “SYM KNIFE”. We have Histo, Ultra, Cryo and Trim types. 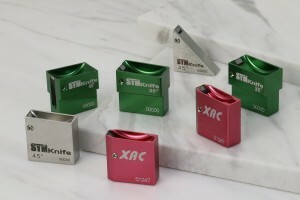 They are 100% made in Japan with very sharp as other diamond products. *We have been producing other diamond tools 40 years and we have some know-how and experience. One of the greatest advantages is our knives have been done hydrophilic treatment from the beginning. It means you do not have to do it by yourself. It is very convenient and stress-free, isn’t it? We also have MGH knife. It stands for “Multi Grid Holder” and nobody else makes this model. *In the near future, you might see the copy that is made by others, but this is original model from Syntek. This holder has 4 grooves and you can set up to 4 grids at the same time. No more stress for gathering samples. Sample movie of MGH is here! Some people are believing diamonds of all diamond knives are made by natural stone. Basically we don’t want to say things that will shatter their dream. On the other hand, we also have a duty to tell the truth to all users. If you are told “Our diamond is natural” by your provider and your knife width is 3.0mm or more, you would better to doubt that information. We do not say the stone is synthetic (artificial / man-made), but if you create wider knives, raw stones may cost more than your purchasing price. Or that maker choses very low-grade stones. It is possible to produce natural diamond knives from Syntek, however it will be 2.0mm or less if you considering the current market price. Our raw stones are selected top or second top quality grades. That might be one of the reasons, nevertheless you should be careful. Please see the details are as below. Is your diamond really natural…! ?